From BoingBoing, an interesting piece on the public domain in the digital age and the concept of copyfraud. Open Culture has an article on the Speech Accent Archive – The English accents of people who speak 341 different languages. Amazon has 31 apps for free today (Saturday) via the Amazon App Store. And on Making Use Of, you will find game, productivity and musical apps are on sale or free for the iPad. Note that I found that some of the pricing did not apply when purchased through a device other than an iPad. My E-book finds of the day are The Golem and the Jinni (P.S.) and The Secret Life of Pronouns: What Our Words Say About Us from my to-be-read list. They are each on sale today for only $1.99. 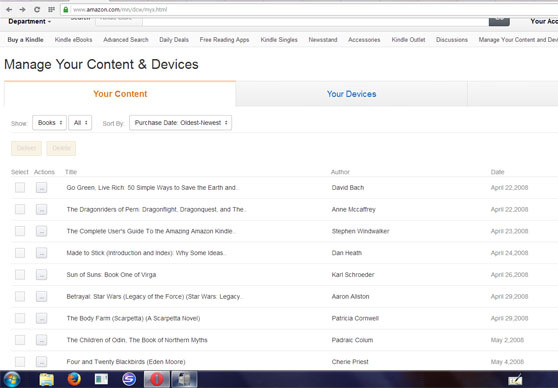 If you own a Kindle ereader, you have probably noticed that Amazon has completely redesigned the Manage Your Kindle Page (now called Manage Your Content and Devices). If you had a large number of books, the old page was a nightmare to try to use. It showed titles newest first and would only show 10 books or so at a time before you had to go to the next page. And after few pages, the system would time out and you would have to log in again and start all over. It was pretty much impossible to see all your books if you had a large collection. Seeing your oldest e-books was something I never managed to figure out how to do. The new page, however, is quite different to use. While some customers haven’t been wild about the changes, many others enjoy the new feature offered by the redesign. (I personally love it!) One of the new features is the ability to sort by your oldest books first. There is currently a thread on the KBoards forums discussing this very subject, asking folks to post the date and title of their first Kindle purchase. My first two purchases on the Kindle were made April 22, 2008. The first book downloaded was a free one, Go Green, Live Rich: 50 Simple Ways to Save the Earth and Get Rich Trying by David Bach and Hillary Rosner (now $11.64). The first paid purchase was the The Dragonriders of Pern Omnibus by Anne McCaffrey for $7.96 (now priced at $9.99). This walk down memory lane was fascinating for me. I can only go back 18 months on my NOOK books. Kobo lists my books, but give little data about them. The page revealed a lot of interesting data about my e-book buying habits: what I bought and how much I paid for the books. I was buying 7 to 10 books a month for my Kindle, and that doesn’t count the classics I was downloading and reading from Project Gutenberg. So, how about you? What was your first e-book? Barnes and Noble says it plans to continue to sell (and support) its Nook Glowlight. There is no mention of what the co-branded tablet will be called. I will be interested in seeing how the tablet is differentiated from Samsung’s own Galaxy Tab series. I currently run the Nook reading app on a Samsung tablet and am also curious as to how the experience of using the new device will be different. Press (or slide) the power button and HOLD for 20 seconds. 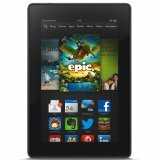 The Kindle start up screen will appear shortly.